Pardon the corruption of one of Shakespeare's most famous quotes. I've been working with Noro yarns lately and the knots are driving me crazy. I'm currently working on a hip length cardigan (changed from semi-fitted) in Noro Silver Thaw and it seems that things will be no different. I really like this yarn, but so far I've run into knots in the first 2 skeins. Each was about halfway through the 100 gm skein. This makes me wonder why didn't they just make them 50 gms and skip the knotting. That aside, I must admit that I'm really enjoying this yarn. This yarn doesn't have the drifting apart problem that sometimes occurs with Silk Garden and even the parts that aren't spun quite as tightly maintain their integrity. It can still be a PITA if you have to frog as some of the fibers get caught on the other, but other than the aforementioned knotting I have no complaints. The cardigan is coming along fairly well. I've worked out my problems with the back and it is now complete. I cast on the front today and was making good progress until I realized I've got and extra row or two in the ribbing portion and me being the perfectionistic person that I am will have to rip it out. Tilt is now in the home stretch. 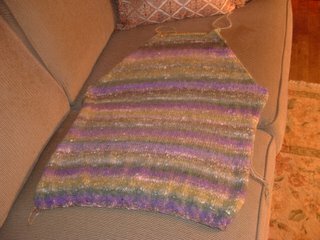 All the main pieces are together including the sleeves which haven't been sewn together because they are way too long. I have over a six foot wing span, not that I'm overly tall it just runs in the family, and they are too long for me. 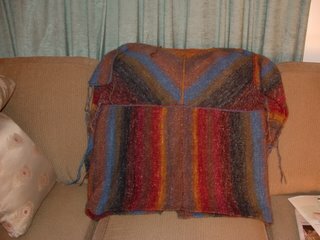 The pick up and and 3-needle bind off for all the sections was headache, but it's what makes the jacket. Tonight I'll pick up the bands and maybe get the collar done. On a personal note, I'm fast approaching my "quit date" for smoking. Am I anxious? Anxious as hell!!! I've been a smoker for about 27 years. I quit for 3 of those years which doesn't count if you start back and briefly for numerous other times. People always tell me you don't look like a smoker, but what does a smoker look like? For this reason, I don't store my stash at home. 1) it's too big and 2) I don't want it to smell like smoke. I'm looking forward to improving my health, numerous medical issues going on here and not having to worry about the smell. It's amazing that I never paid attention to the smell until my masseur asked me if I smoked. He smelled it in my hair. So here's to positive life changes and better health in the future. 1. I had no idea that you smoke. 2. I'm jealous that you have a masseur. P. S. The sweater is looking great. I can't wait to see it. Your sweater is looking great. That Noro is beautiful yarn isn't it! I found you in the new knitting blog rings and was looking at previous posts. I love the black and white socks you mad! I'm the next blog over in the Knitting Blogs ring. Congrats on approaching your quit-date. I'm also a knitter/spinner/smoker and I just hate the smell on my finished work. Maybe I'll find the inner strength someday soon. Good luck!!!! Yeah, what Calvin said on both counts! Good luck quitting. I hope you make it. Good luck on quitting, it's one of the best things I every did for myself! Love that Noro yarn-the colors are just amazing.